BANGKOK: A Reuters report early Wednesday (June 29) said that the US has decided to remove Thailand from its list of worst human trafficking offenders, a move that could help smooth relations with the military regime. The upgrade, confirmed to Reuters by a US official in Washington and a Bangkok-based official from an international organisation with direct knowledge of the rankings, would mark a rare boost for US-Thai relations. Ties between the countries have flat-lined since the 2014 military coup d’etat, which Washington strongly condemned. The US report is expected to cite improvements in Thailand’s efforts to combat human trafficking, especially in its vital multi-billion dollar seafood industry, the US official said. The Foreign Ministry says Thailand has worked tirelessly over the past year to improve its human trafficking situation and stands by its efforts even if the country doesn’t budge from its low ranking in the US State Department’s upcoming report. 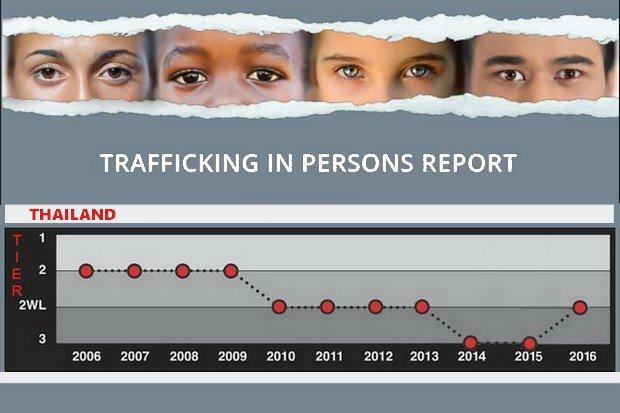 “Whether or not Thailand is upgraded from Tier 3 in the next report, our country will keep doing its best to wipe out human trafficking activities,” said Songsak Saicheua, director-general of the American and South Pacific Affairs Department, in reference to the Trafficking in Persons report to be released Thursday. “We will continue moving forward with our anti-human trafficking policy,” he said, adding Thailand has covered all the minimum standards which the TIP office requires. Mr Songsak said the number of human trafficking cases has increased from 280 in 2014 to 317 in 2015, with more cases being investigated to bring those people involved to justice, with 547 suspects arrested last year, most of whom had connections with government officials, police, military officials, local politicians and influential figures. “Corrupt officials will not only face disciplinary action, but also life imprisonment, especially when trafficking results in a victim’s death,” he said. He added that 34 officials have been identified in connection with the trafficking of Rohingya migrants after Thai authorities raided an illegal border camp in Padang Besar in Songkhla’s Sadao district in early 2015. The Anti-Human Trafficking Act 2015 is being amended for the third time to deal with trafficking cases more effectively, he said. Phil Robertson, deputy director of the Asia Division of Human Rights Watch, was quick to credit the military regime. According to Mr Robertson, the regime’s crackdown to this point “have not diminished the systematic and pervasive impunity enjoyed by local police and other officials to abuse migrant workers that we see daily in areas where migrant workers concentrate. The upgrade would put Thailand on the so-called “Tier 2 Watch List” and remove it from the rating for countries with the worst human-trafficking records, known as Tier 3. In a parallel move, the report will drop Myanmar from watch-list status to Tier 3. Diplomats said the low ranking comes from child soldiers and use of forced labour by the military, and by the country’s attitude towards Rohingya. Thailand was downgraded to the lowest ranking in June 2014 just weeks after the military seized power. Thai officials were incensed last year when Malaysia was upgraded from Tier 3 but Thailand was not, and even human rights advocates agreed that Bangkok had made a greater effort to curb human trafficking than Kuala Lumpur. In this year’s report, the State Department has opted to keep Malaysia at the higher ranking it received last year, according to the US official. State Department spokesman John Kirby declined to comment on the tier rankings: “We will not comment on the contents of this year’s report until after the report is released,” he said. Phuket Opinion: Is this Phuket’s day in the sun?